Philadelphia City Councilman, Kenyatta Johnson, center, flanked by two fellow members, speaks at the podium during a press conference outside the Starbucks on 18th and Spruce Streets. Just a few days after six Philadelphia police officers arrested two black Starbucks patrons who were waiting for a friend before ordering, after the store manager called police, Philly politicians made it clear whom they blame for this mess: Starbucks. 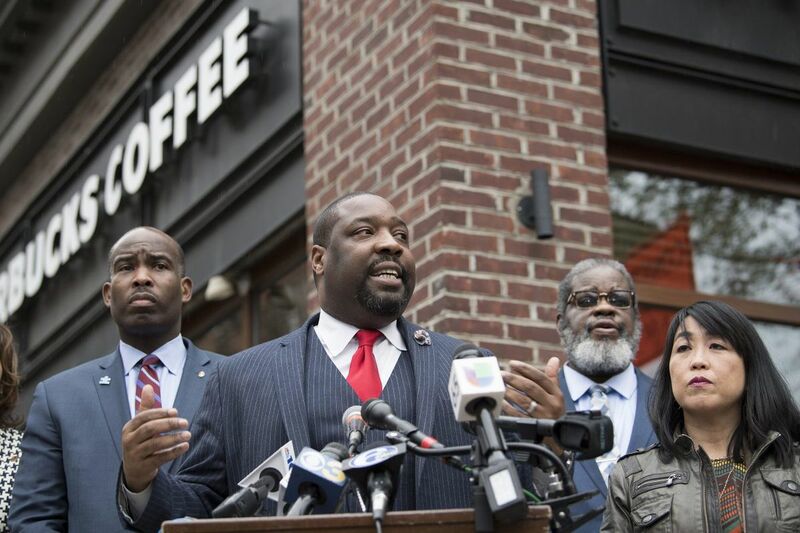 During a news conference, City Councilman Kenyatta Johnson said that he and other Council members were there to "denounce the actions of Starbucks." Johnson also called his meeting with Starbucks' CEO "all lip service." In a separate statement, Mayor Kenney wrote that he was "heartbroken" by the incident and that "Starbucks has issued an apology, but that is not enough." The mayor promised that the city would "examine the firm's policies and procedures." Make no mistake, Starbucks is a villain in this story, and I support those who call for a boycott of the chain. I also support firing the employee who called the police. Starbucks, however, did not arrest anyone. Philly police officers, instead of using discretion to make clear that the two men did nothing wrong, made the decision to handcuff the clients and hold them for eight hours. I agree with the Rev. Mark Kelly Tyler of Mother Bethel A.M.E. Church, who said, "This isn't about one Starbucks and those six cops." Context matters here. The now-infamous Starbucks is located in a police service area in which 67 percent of all stops by police in the first half of 2017 were of black pedestrians, while only 3 percent of the residents are black, according to the American Civil Liberties Union's most recent report on stop-and-frisk. It's also worth noting that the Police Department is mandated to serve and protect the population of the poorest of the 10 largest cities in America. While of the 1.5 million residents of our city, 41 percent are black and only 35 percent are non-Hispanic white, more than half of the police force (53 percent) is white. The Starbucks arrest is what happens when racist policing and racial segregation meets demands of a corporate entity. It happens every day. The only difference is that this time it was caught on camera. The racist arrest is also consistent with past behavior of Philly's police department. Last year six black police officers filed complaints against their white supervisors as being racist and corrupt. The department still employs a police officer with a Nazi tattoo on his arm. This is also the police department whose officers shot and killed two black men in the last year: unarmed, 25-year-old Dennis Plowden Jr. and 30-year-old David Jones, who was shot in his back while fleeing. Neither officer has been charged with a crime. Finally, this is the department that is entering its eighth year of a consent decree following the settlement of the stop-and-frisk discrimination case from 2011. With years to implement meaningful reform, with a court order, and after a campaign promise by Kenney that if elected mayor, "stop-and-frisk will end in Philadelphia, no question," the Police Department still disproportionately stops people of color and continues to conduct unconstitutional stops. Reggie Shuford, the executive director of the ACLU of Pennsylvania, connected the incident in Starbucks to stop-and-frisk in his statement, "For seven years, the city has tracked the data on racial disparities in stops and frisks by the police. Despite the fact that these disparities remain, it seems that there is no price to pay for officers who continue to mistreat black Philadelphians." Unwarranted stops, racial profiling, and lack of accountability are nothing new for the Philadelphia Police Department. Thus it is not surprising that Police Commissioner Richard Ross declared that the "officers did absolutely nothing wrong." I am unimpressed by the calls of the mayor and Council members to demand a review of Starbucks' corporate policies and require "implicit bias" training (there is literally no evidence that it changes behavior). An overhaul of the Police Department is overdue, and it is time that someone starts to pay the price of racist policing. As long as city officials talk about Starbucks without root transformation of policing in the city, I agree with Councilman Johnson: It's "all lip service."